BEECH GROVE—Love for God and love for nursing led Benedictine Sister Rebecca Marie Fitterer to join the Sisters of St. Benedict of Our Lady of Grace Monastery after graduating from the sisters' former academy in 1969. A religious vocation with the monastic community just seemed like the right choice for her life, Sister Rebecca Marie explained, and her latest assignment as administrator of St. Paul Hermitage, the sisters' retirement home, is a wonderful ministry opportunity, too. "When I was a junior in high school, the idea started to form in my mind and wouldn't go away," she said about answering God's call to profess her monastic vows with the Benedictine sisters after growing up in Holy Spirit Parish in Indianapolis. "I asked to enter the community after graduation," Sister Rebecca Marie explained. "It was a very positive experience for me. My parents were very supportive." Her early ministry assignments as a staff nurse at the Hermitage and monastery infirmary were followed by community service in formation and as sub-prioress then clinical and administrative work at several hospitals as well as positions as assistant director of nursing and later director of nursing at the home. Now, Sister Rebecca Marie has a prayer list of goals to accomplish after being named administrator of the health care facility by Benedictine Sister Juliann Babcock, the prioress, then completing licensing requirements and beginning her duties on July 1, 2011. St. Paul Hermitage was founded in 1959 by the Benedictine sisters of Monastery Immaculate Conception in Ferdinand, Ind., at 501 N. 17th Ave. in Beech Grove at the request of the late Archbishop Paul C. Schulte. The Hermitage also serves the archdiocese as a retirement home for priests. The Hermitage is licensed as a residential care and comprehensive care facility, Sister Rebecca Marie said. "We have about 100 beds, and about 120 staff members. We offer physical therapy, occupational therapy and speech therapy, and we have two full-time activity directors." Five priests—Father Gerald Burkert, Father Thomas Murphy, Father Herman Lutz, Father Elmer Burwinkel and Father James Rogers—are among the Hermitage residents. "We are very happy that we can offer daily spiritual activities," Sister Rebecca Marie said. "We have daily Mass, and there is a group that prays the rosary daily. We also offer Mass in the health care center weekly." Her new ministry assignment has been "a good fit," she said. "I'm growing into the position. I learn something new every single day. I've been blessed with a wonderful staff. The transition has been easier than I thought it would be." Future goals include offering more choices for the residents, she said, as well as working with staff members to implement some of their ideas for other improvements. 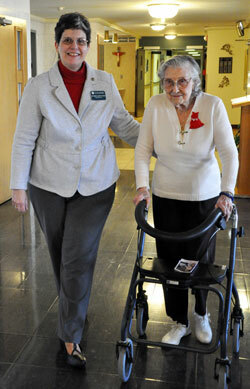 "It's been a really good experience for me because I find the staff very receptive," Sister Rebecca Marie said. "The residents are very happy here. They want to share their lives with us. In the health care wing especially, the nursing assistants and the nurses become part of the family. "All of the kitchen staff members know the residents very, very well," she said. "They know what the residents like, what they don't like, and cater to that as much as they can. There's a lot of love here. It really becomes home as much as we can make it that." Sister Rebecca Marie hopes to expand assisted living care and the health care center as well as update residents' rooms with newer amenities. She also wants to enlarge the dining room and fitness facilities. 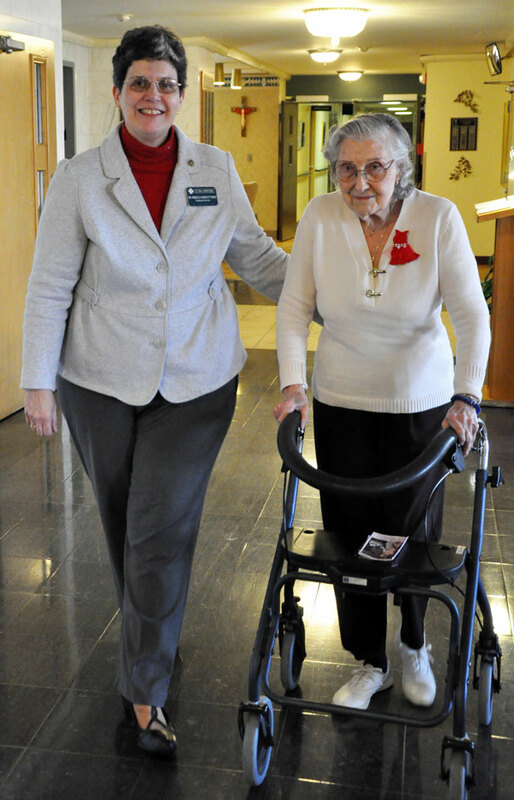 Each morning, when she makes her rounds to greet all the residents, Sister Rebecca Marie said, she is always energized by one elderly woman's enthusiastic attitude. "Every day is a good day for her," Sister Rebecca Marie explained. "Every morning is a good morning. And that's her mantra. 'Oh, happy day!' And I think, you know, it is a happy day. We've got so many blessings. If anything, it's made me count my blessings, and when my day is busy or stressful I can think back to her greeting. She brightens my day. She is a disciple of Christ, and she doesn't even realize it. I really appreciate that." All the residents brighten her work day in many ways, she said, which is a priceless blessing in her ministry. "I've had a wealth of experience in my life from the opportunities I've had, the places I've been able to work, the people I've met and the education that I've had," Sister Rebecca Marie said. "It's just been wonderful. God has blessed me."